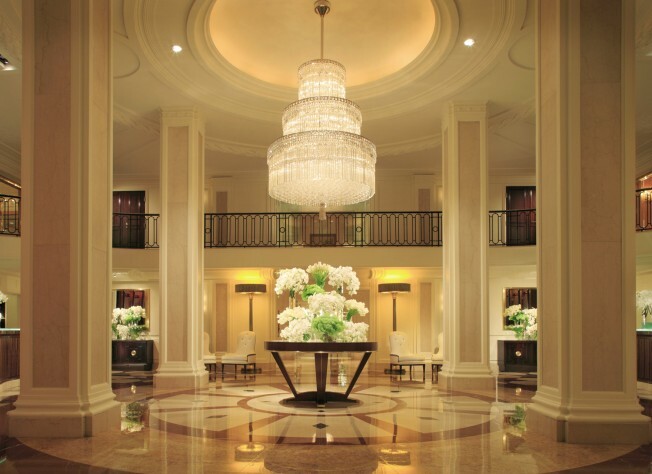 The lobby of the Beverly Wilshire Hotel. High Rollers can indulge their whims and help disaster victims thanks to a benefit underway at the Beverly Wilshire Hotel. The hotel, which recently launched a long-planned 50th anniversary celebration, decided on Monday to use the event to raise funds for disaster relief as part of a nationwide fundraising effort plan by the Four Seasons Hotel chain. For a cool $50,000, a guest and up to five friends can enjoy a night in the newly renovated Presidential Suite. Guests have the use of a 1961 convertible Rolls Royce and can enjoy a private in-room dinner prepared by Ari Rosenson, the chef de cuisine at CUT Steakhouse. The package, dubbed "A Night With Friends," also includes a sommolier-led tasting of several 1961 vintage wines from Bordeaux. For every night booked, the hotel will donate $5,000 to the Red Cross fund for Japan, said Jennifer Cooke, head of public relations for the Beverly Wilshire. "It was a natural for us," she said. No packages have been booked yet, but "hopefully we'll book a few," she said. The promotion runs through the end of 2011. "We do get a fair amount of business from Japan," she said. "We're quite an international hotel." The hotel is also matching employee donations one-to-one, she said, and is planning other fundraising opportunities for Japan during its anniversary celebration. At the opposite end of the indulgence spectrum, the celebration also includes 50-cent martinis every night beginning at midnight for 19 minutes and 61 seconds beginning Monday. The Beverly Wilshire was originally constructed in 1928 and has changed hands several times. In 1961-- year one of the anniversary being celebrated now-- it was purchased by a group of investors. Four Seasons Hotels and Resorts has managed it since 1992.